Is it true that wearing an opal will bring bad luck if it’s not your birthstone? Apparently not– derived from the Latin word for precious stone, the gemstone opal has been revered and worn since ancient times. The Romans obtained opals from the mines in Czechoslovakia until 1788, which yielded a variety of white opaque with flashes of internal rainbow colors. Romans treasured opals, and wore them in rings as symbolic intaglios representing love, hope and purity. The aboriginal name Coober Pedy in southern Australia means ‘a man in a hole’ —which is exactly how the miners extract opal. The summer temperature is unbearably hot, so the miners build their homes in underground excavations on a hillside.The fragile, white opal may crack when brought up from the cool depths of the earth into the hot and arid temperatures. Opals are brittle, easily chipped and scratched. The hardness of the opal varieties varies from 5.5 to 6.5 on Moh’s scale. If exposed to high temperatures they may crack or craze. The fragility of the stone makes it challenging to cut and polish, adding to its desirability. The flashing colors, unique to opals, can be described as ‘neon lights’ reflecting a rainbow of colors from within the opal. Using scanning electron microscopes, depicting transparent spheres of silica tightly bonded together, explains the flashing phenomenon from within the opal. The spaces within the spheres have molecules of water- this arrangement breaks visible white light into separate colors by diffraction of light. 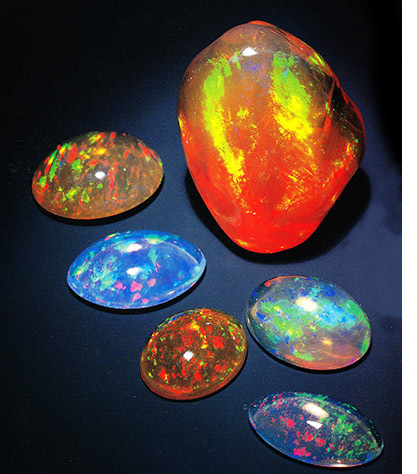 In lesser quality opals, the silica spheres are not arranged in a regular pattern; therefore the opal will not look as colorful. Opals that do not flash colors are lacking spheres of silica and water molecules. Fire opals have one overall body color that is transparent orange to red and are not in the variety with silica and water. Australia produces 85 percent of the world’s supply of opal. Other smaller sources of fine gem opal are from Mexico, Brazil and the United States. Australian opal is unique in the fact that it is found in sedimentary rocks formed in horizontal layers and also from the volcanic rocks formed at higher temperatures. 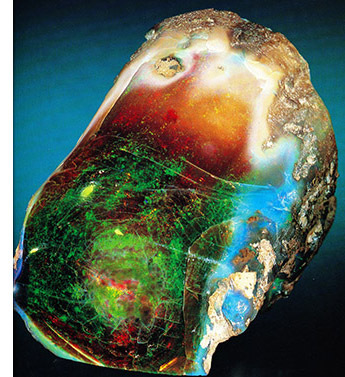 Opal is discovered in five types of distinct colors. White opal has a light or white body color with strong flashes of rainbow colors. Black opal has a black or dark blue, green or grey body color with strong vivid flashes of color. Water opal has a transparent, colorless body with brilliant flashes of different colors. Boulder opals are opaque with a deep blue to purple body, with the natural matrix affixed to the stone, internal flashes vary from greens, blues and purple hues. Fire opals, from Mexico have a transparent orange to red body color and do not have any flashes of internal color. While following a wounded kangaroo through the hot desert in Queensland, trackers found loose opal on the ground. This type of opal is known as sandstone opal because it is in freestanding sandstone veins and is easier to remove than boulder or black opal. This find started the mining of the White Cliffs opal field in 1889. Thin veins of fine quality boulder opals were first discovered in 1872, in the deep caves in Australia. One of the most valuable and beautifully colored varieties of opal, with internal flashes of brilliant colors is mined in Queensland, Australia. This unique variety of opal is called, Boulder Opal and has a backing of ironstone matrix. The thin, but brilliant colored boulder opal was primarily used for carving cameos. They are not to be mistaken for doublets because a boulder opal is one piece, as opposed to a doublet with a non-natural backing artificially attached. Opals that are cut very thin and have a pale white color are often adhered to a dark backing of black onyx or a black glass, a technique used to enhance the colors in the opal. Primarily mined in Mexico, fire opals are transparent with an orange to a deep red body color. Fire opal is found in many areas of Mexico in cavities of volcanic lavas and was known to the Aztecs. 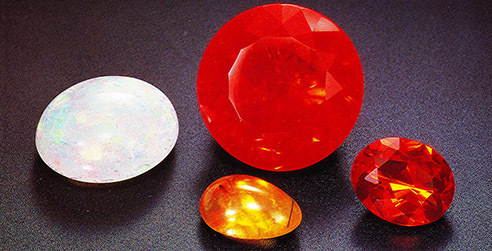 Evaluated by their color, clarity and transparency, fire opals with a vibrant red color are the most valuable. Other colors range from yellow to brown and orange hues. Fire opals are the only variety that can be faceted. Other types of opals that are not considered gemstone varieties are an opaque green color, similar to that of chrysoprase, cherry-red, yellow and a rose– all of which are opaque. Hyaliteis the colorless, completely transparent variety of opal that looks like glass, sometimes called Muller’s glass. Imitation opal is made of small fragments of real opal set in a black resin. Sir Walter Scott wrote the novel, Anne of Geierstein, a tale about a beautiful woman who believed that her moods and chance of luck were affected when she wore opals—blaming the opals as the cause of her ill fortune. Scott’s novel created the negative lore of opal jewelry, linking it to tragedy and creating superstition. Some of the most important historical jewelry made from opal was created during the Art Nouveau period. Rene Lalique, the French jeweler (1860-1945), used opal frequently in his renderings of natural elements in jewelry. Lalique became famous for the opal jewelry he designed for Sarah Bernhardt(1844-1923) that she wore on stage. And, contrary to Sir Walter Scott’s novel with bad luck opals—Bernhardt had great luck and fortune in her life as she wore her opal jewelry everyday.Shakespeare referred to an opal as “the queen of gems” in his book, Twelfth Night. Photo and some information credit: Getty Images, Alexander Deleuse.